A police officer checks out a car on grass with his canine near the U.S. Capitol on Thursday in Washington, D.C. The Capitol and the White House were placed on lockdown after an 'active shooter' situation was reported. We last updated this post at 7:19 p.m. ET. 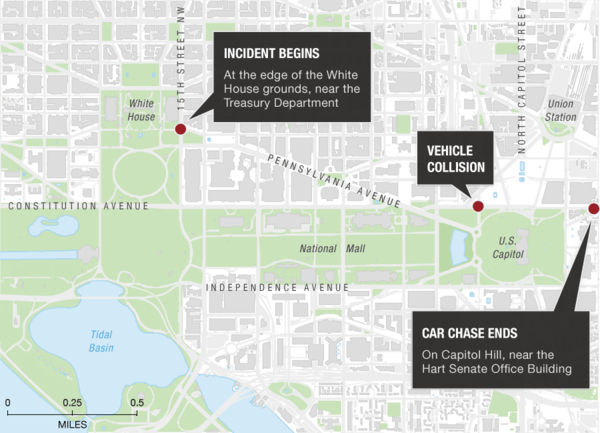 A woman who authorities say tried to ram a security barrier outside the White House led the Secret Service and U.S. Capitol Police on a high-speed chase that ended near Capitol Hill, where gunshots were fired by police. Congressional lawmakers were briefly ordered to shelter in place, but by 3 p.m. ET, police had lifted the lockdown. The incident left a suspect dead and two police officers injured. The 1-year-old child who was in the car with the suspect is OK and in protective custody. In a news conference, Washington, D.C., Police Chief Cathy Lanier said she was "pretty confident that this is not an accident." The woman, Lanier said, first tried to breach a security check point at the White House. The New York Times quotes a tourist, who was by the White House, saying Secret Service agents tried to stop her with "one of those little metal fence sections." But B.J. Campbell tells the paper that the woman hit the gas, ramming the barricade and hitting an officer, who flipped over the hood of the car. "After she ran him down, she gunned it, and she just went screaming down Pennsylvania Avenue," he told the paper. "They were busy calling on their phones, on the radios. It was like poking a hornet nest. There were guys everywhere. I didn't see anyone with their guns out, but they were sure busy." Lanier said that's when the woman, whom authorities declined to identify, drove toward the Capitol complex, where she attempted to breach another security point. Witnesses report that some 20 police cars were involved in the chase of the woman's black vehicle. A video of the incident shows the black car being chased by police, speeding to a halt near Garfield Circle. The vehicle is surrounded by several officers with sidearms drawn before it speeds away. Lanier said that after that, the woman drove the vehicle several blocks from the Capitol where she crashed and officers opened fire. The woman was declared dead later, a result of "injuries sustained in the shooting," the Secret Service said. Authorities would not say if the woman was armed, but The Washington Post and NBC News are reporting she did not have a weapon. Chief Dine, speaking to reporters at about 3:40 p.m. ET, said the scene had been secured and that there was no reason to think the incident was anything other than isolated and that it was not connected to terrorism. Both officers hurt in the incident are expected to be OK, officials said. "The President was briefed on the reports of gunfire on Capitol Hill this afternoon. White House staff are in touch with law enforcement and monitoring the incident," A White House official told reporters. "Several senators were outside the Capitol when they reported between four and six shots fired. 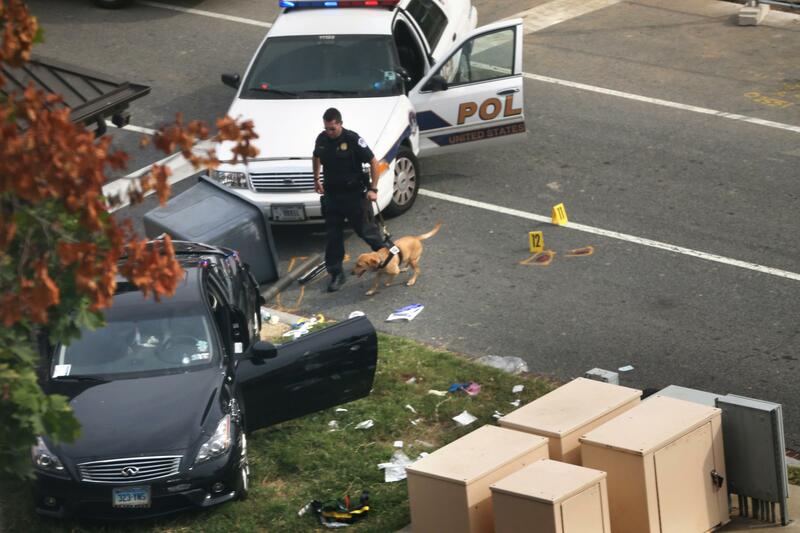 Police officers in a high-speed chase pulled over a black car in front of one of the Senate office buildings, but witnesses said a man fled on foot with a gun visible. 'I heard a pop-pop-pop, and we were told to get down,' said Senator Bob Casey, Democrat of Pennsylvania. Senator Sherrod Brown, Democrat of Ohio, said he saw people in the area drop to the ground, and Capitol police officers yelled for him, Mr. Casey and Senators Jeff Merkley of Oregon, Roger Wicker of Mississippi and Bernie Sanders of Vermont to lie on the ground." "As a warning was sounded, the House abruptly went into recess and lawmakers left the chamber floor. The House had just finished approving legislation aimed at partly lifting the government shutdown by paying National Guard and Reserve members. The White House was quickly locked down after the incident at Capitol Hill and the stretch of Pennsylvania Avenue in front of the compound was closed to pedestrians. Secret Service said the procedures were precautionary." Multiple news outlets, including NBC News and USA Today, are reporting that the car involved in the incident was registered to a Connecticut woman. The Washington Post reports authorities believe she was also the one driving the car. NPR has not independently confirmed the name of the woman. "Capitol police could be seen with semi-automatic rifles drawn as they scrambled for position on the Capitol grounds. "Several senators were outside the Capitol when they reported between four and six shots fired. Police in a high speed chase pulled over a black car in front of one of the Senate office buildings but witnesses said a man fled on foot with a gun visible. "'I heard a pop pop pop and we were told to get down,' said Senator Bob Casey, Democrat of Pennsylvania."